Direct from its special Baselworld 2017 exhibition display called “Design Genius and the Dot that Changed the Face of Time,” Movado’s Museum Watch this year is seventy years old, and Movado has issued a special, colorful edition to celebrate. Bauhaus-influenced artist Nathan George Horwitt designed the watch in 1947. He placed a solitary dot at 12 to symbolize the sun at high noon, and its simplicity and minimalist profile struck a chord with the era’s designers. When the dial was selected in 1960 to join the permanent design collection of the Museum of Modern Art in New York, it became the first watch dial ever awarded this distinction. This 70th Anniversary Bauhaus Limited Edition features three new models in 35mm round stainless steel or yellow gold-toned cases, each just 5.85 mm deep with narrow polished bezels. 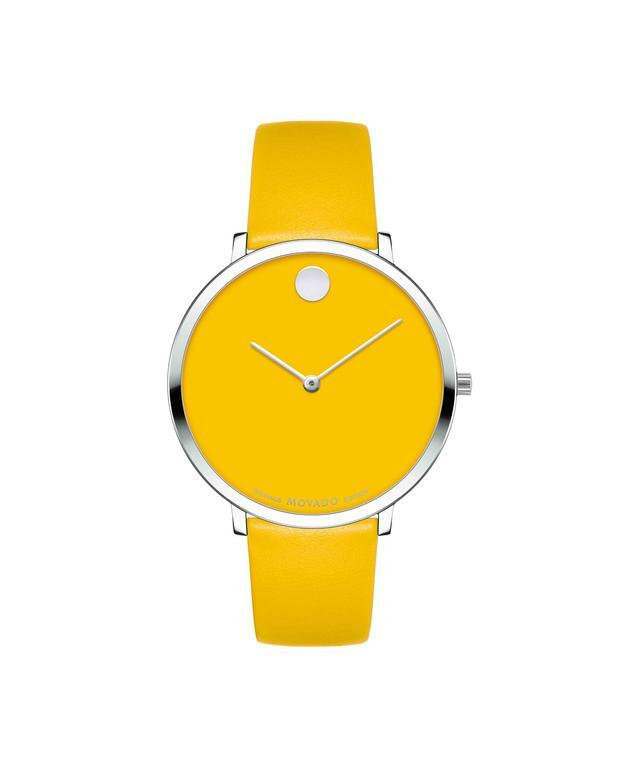 Adhering to the Bauhaus preference for primary colors, Movado has created dials of yellow, red or blue lacquer, each with matching calfskin straps. The dials are set with a flat dot and thin stick hands in tribute to Horwitt’s original design. 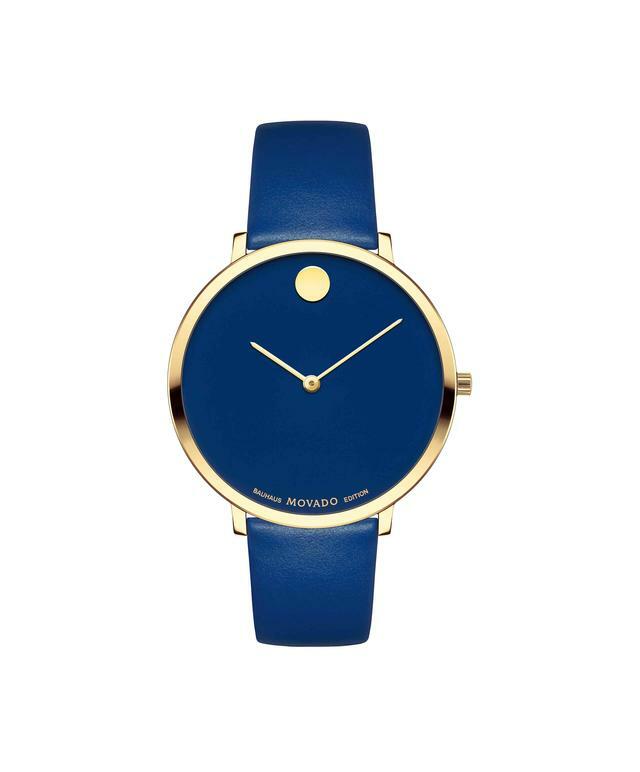 The collection is being issued in an edition of 210 total pieces, seventy of each color, with individually numbered case-backs engraved ‘Movado Bauhaus Edition.’ These will be sold exclusively on Movado.com. An unlimited edition of these same watches with casebacks engraved “Movado 70 Years of Modern Design” and black, white or gray dials (not pictured here) will be available at retailers worldwide. The unlimited edition will also be made in a second size (40mm). MOVEMENT: Swiss quartz ETA 901.001. DIAL: Yellow with silver-toned stick hour/minute hands and flat dot at 12 o’clock; or blue or red with yellow gold-toned stick hour/minute hands and flat dot at 12 o’clock. CASE: 35mm round polished stainless steel or yellow gold PVD-finished steel with flat scratch-resistant sapphire crystal. Individually numbered case-back engraved ‘Movado Bauhaus Edition’ Water resistant to 30 meters. STRAP: Yellow calfskin with stainless steel classic tongue buckle, or blue or red calfskin with yellow gold PVD-finished steel classic tongue buckle.